The title is no lie. This thai place is sooo good. It is so good in the fact that we probably went here 5 times while we were in Paris for the month and even chose it as the last meal of our final night. 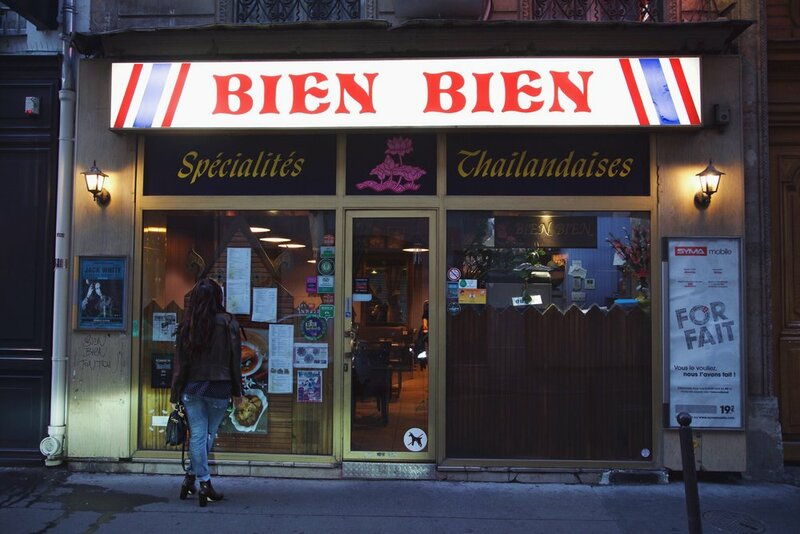 Bien Bien is a small thai restaurant located in the middle of Paris and lucky for us just a 12 minute walk from our apartment. Located on a quite street, the simple place is a very casual dining experience, however don't let that make you think that it's not busy! We made sure to get there early, the first time we went and by the time we left there was a waiting line to sit down. We countered this the other various times by getting take out and bringing it to our apartment or eating outside along the Seine river. Go here if you're solo, on a date or with the family and want great food at a good price(6-15euros). Not to mention, the staff which is the family who owns the place are all super nice! Fresh fish with chili sauce. 2 thai beers, duck curry, fresh crispy fish with chili sauce, chicken pad thai & coconut milk soup.